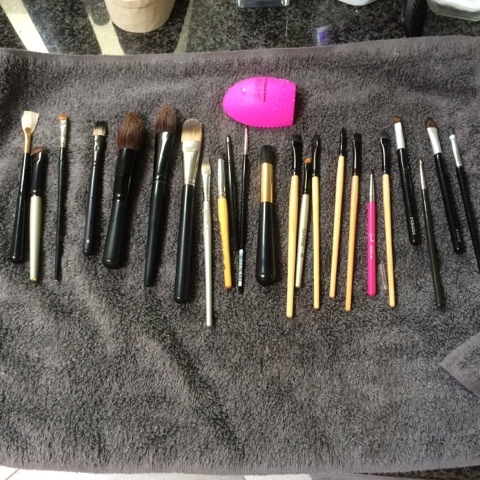 If you are anything like me, you love doing your make-up and using your brushes, but cringe when it comes time to clean them. No longer! I was getting my nails done recently and lamenting how I had to come home and clean my brushes, which was going to take me at least an hour. Getting an hour with a newborn all to yourself is rare and the last thing I wanted to use it for was cleaning my brushes. I would rather sleep. Period. All the time. Anyway, that is when the Shmink brushegg came up. I love Shmink make-up and the brushes, but I was skeptical of the egg. Isn't this just another gadget that doesn't really save time? That little pink egg. Ten minutes. All those brushes. I kid you not! I think I'm in love. Also, now I don't have any reason to put off cleaning my brushes.